Not all machines are the same and the way to separate one machine from another is to learn how to “read” a machine by looking at the pay out schedule on the front. The first bit of information that you will see is the coin denomination that is required in order to play that machine. 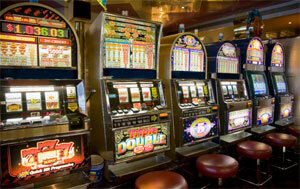 One of the most common misconceptions about slot machines is that you need a quarter to play all machines. That is not the case. There is a variety of different types of machines. Some slot machines do take a quarter but there are also penny slots and machines with denominations much higher than a dollar. In many slot machines players can even feed large notes for playing credit. The payout table of a slot machine lists the various combinations that the machine will pay out when they are hit. These payout tables are displayed in some form, usually graphically, on the face of the machine, either at the side of the display screen or on another section of the machine. Online slot machines display the payout tables next to the screen in which the slots spin. Alternatively the machine will provide a payout table button that you can press to display the payout table at any time. Payout tables can look daunting when first encountered, but they essentially represent the various combinations of symbols and slots that will payout out at different rates. Given that you can do nothing to manipulate the spinning of the slots and reels, you do not have to memorize or even have a full understanding of the payout tables, as the machines will automatically pay out according to their payout tables. However it can't hurt to have a basic understanding of how they work. In their most basic form, slot machines will pay out if you hit certain combinations - for example, 5 cherrys in a row. This is straightforward. However they also pay out for more complicated combinations, such as 3 cherrys in the same row, plus a wild symbol in any row, combined with a cherry in a specified position, for example. The payout table will indicate by graphically showing this combination, along with the factor by which your bet will be multiplied if you hit the combination, which determines the payout on your wager. When you hit this combination on the actual slot screen, as line will appear connecting the different symbols, indicating on the slot screen that you have hit the combination. You can then check the payout table to see what the payout factor is for that particular combination.